Tall, fluffy, flaky buttermilk biscuits with crisp edges and soft, tender middles are just a few minutes away. 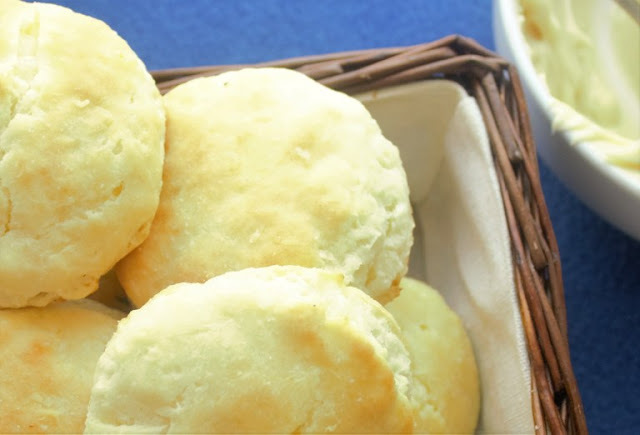 Quick, easy, and with these secrets, you can make perfect biscuits every time. Preheat oven to 450 degrees F. In a large bowl, cut the butter into the flour with a pastry blender/pastry cutter. Blend until the butter is the size of peas. Pour in buttermilk and gently stir with spoon until dough is just put together and the flour is a shaggy dough, do not over mix . This is optional, but cover your dough with plastic wrap and put in the fridge for five to ten minutes to cool the dough or keep it cold while you clear your workspace. Working quickly, take your dough and mold it into an 1/2-inch thick rectangle on a well-floured surface using your well-floured hands. Fold dough in thirds or cut in half and flatten out again. Repeat this quickly, about three or four times. You've just created layers. Flatten into a 1/2-inch thick rectangle once again using well-floured hands. Using a biscuit cutter or glass cup that has been floured, use the press down/lift up motion to cut out biscuits as close to one another as possible and transfer them onto a parchment lined baking sheet or plate (whatever fits in your freezer). Freeze for 2-5 minutes. Put biscuits on parchment lined baking sheet, either against each other for soft edges or apart for crisp edges, and put into the oven for 15-17 minutes. They should be slightly golden brown, tall, and fluffy. Brush with melted butter. Eat hot, with homemade honey butter, or drizzle a little honey on top. Spread some jam in the middle, get some gravy, whatever your heart desires. 0 Response to "SOUTHERN BUTTERMILK BISCUITS"